Ok, it's literally still snowing here BUUUUUT! 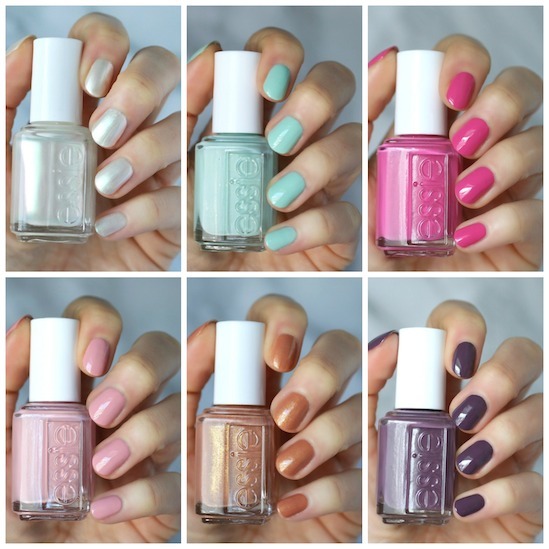 I'm still super excited to share swatches of the Essie Summer 2018 Collection! Over a month ago, Crystal (@lovefreshpaint) and I discovered this collection was already on pre-order on Amazon. I thought the overall color palette wasn't very cohesive and the white polish with shimmer called 'All Daisy Long ' looked like a dupe for Sweet Souffle. All in all, I was pretty underwhelmed. A week later a package came in the mail from Essie Canada. Oh my gosh! These polishes are SOOO much prettier in person! Any feelings of being underwhelmed were gone. I'm loving these. "This summer let's walk barefoot in a sunny daze and spread the good vibes all daisy long. With everyone making harmony, there is no doubt the fuchsia is bright. It's the age of empower-mint. So this summer don't forget, young wild & me is the only way to be!" All Daisy Long is not at all a dupe for Sweet Souffle...it's an iridescent polish!! Can you believe it?! Essie did an iridescent polish. It is however, quite streaky and showing off allllllll the flaws in my nails. I took off my first coat and decided to put down a base of Essie Fill the Gap. Oh yes, that's the way to go. Looks much better with Fill the Gap underneath. It's opaque in 2 coats but there's still some brushstrokes. ...and here it's totally pink. Yeah, they don't even come close. 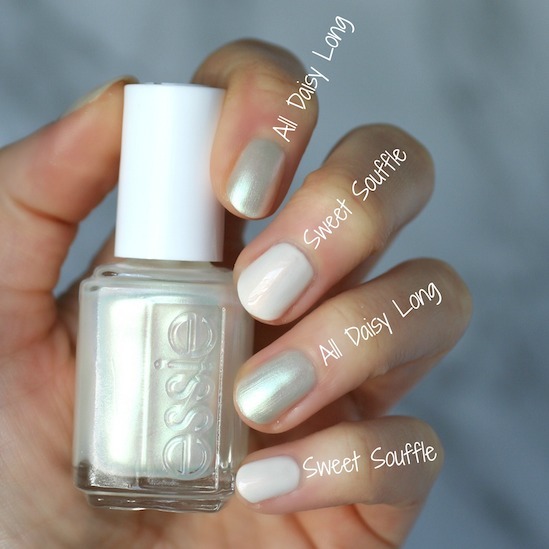 I had no other Essie's in my collection (over 400) that looked anything like All Daisy Long. This picture really shows you that greenish shift this polish has. 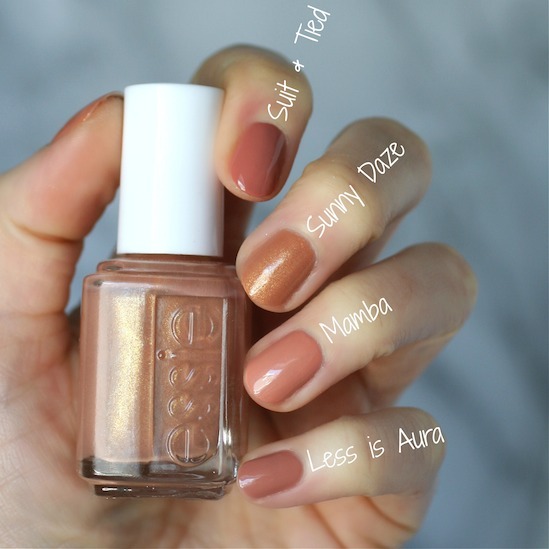 This one is similar to all the nudey brown colors that Essie has been coming out with recently but it's lighter and FULL of tiny gold glitter. It applies really nicely despite the glitter. It's opaque in 2 coats and is really beautiful and self-levelling. Great formula. Sunny Daze is much more golden caramel than the others which have a lot of pink tones in them. I knew Essie didn't have a polish this color full of gold glitter but I couldn't even find one that has this base color. Very unique. As soon as this one arrived, I knew it was going to be a favourite. It's a gorgeous muted pink with some mauve tones. It applies beautifully and is self-levelling and opaque in 2 coats. 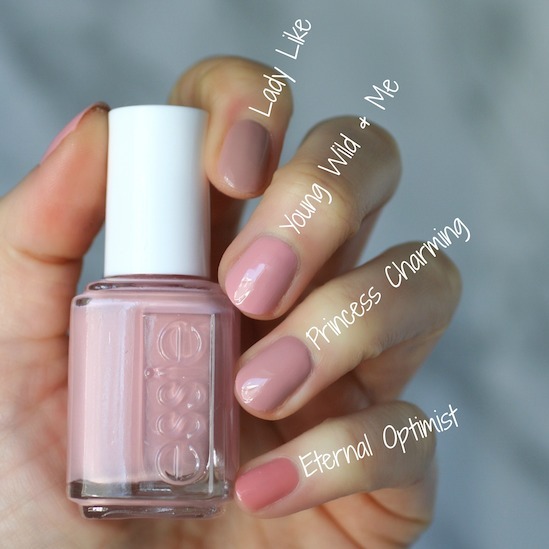 Young Wild & Me is closest in color to Princess Charming but it's brighter and has more pink tones. No wonder I like it so much! I really love Princess Charming, but I'm also digging that they are definitely different. 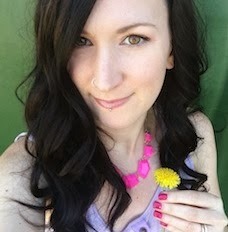 Being brighter and more pink, Young Wild and Me is like the spring/summer version of Princess Charming or Lady Like. This is a beautiful mint with a a really good two coat formula. It reminds me so much of Blossom Dandy, so I'm curious to see how it will compare. The formula was super nice though. Sooooo....there's a slight difference between Empower-Mint and Blossom Dandy, but not much. Empower-Mint is ever so slightly more green and saturated in color, but that's it. The formula's are really similar too (both are great). Fashion Playground is more green, Mint Candy Apple is more blue and Bon Boy-age is much dustier in comparison. Empower-Mint is really nice but I wish it wasn't so close to Blossom Dandy. I would say you don't need both. This is a bright pink creme with a gorgeous formula. It's very smooth and opaque. It's basically a one-coater. I still used two coats but it's so nice and easy to apply. These were the pinks closest in my collection but none of them quite have the same undertone and saturation as The Fushcia is Bright. TFIB has the best formula out of all of them. Ok you guys. My jaw hit the floor when I opened up the box and found this dusty purple inside. It's SO GORGEOUS! And the formula is sooooo nice. It's really opaque and creamy. It looks best applied with 2 coats but it's basically opaque in one. The polish dries down a bit darker than when you first apply it but I am so down with this smokey plum shade! These smokey purples are my jam! Loving all of these, but I'm also happy to report that Making Harmony is totally different than all of them. It's a warm toned purple like Turn 'n' Pose but with the smokiness that Tone It Up and Winning Streak has. This is the standout fave of the collection for me for sure. And because @movemountains suggested it, I put a coat of All Daisy Long over Making Harmony. You have to be really careful (because brush strokes) but it does create a pretty cool effect. It's reminding me of a more intense version of For the Twill of It. So what do you guys think?! I'm pleasantly surprised. There are lots of original colors in this collection and lots to get excited about. Especially Making Harmony. I've got all the heart eyes for that polish! Which ones are catching your eye? This collection is available now on Amazon (U.S.) and I'm sure will start trickling into U.S. stores very shortly. Canada always gets these collections about a month later, so you'll probably see this one in stores in May. I'm sooo excited for Young, Wild, and Me and Making Harmony! Thanks for bringing us the early scoop on this collection! I’ve had this collection and the seaglass shimmers collection on my amazon wish list for the past month. 2 just got added to my cart; young wild and me and the fuscia is bright. So pretty!! A lovely collection. I really like the look of Young Wild and Me, so will definitely be adding this one to my collection. I haven't made my mind up about the others yet. 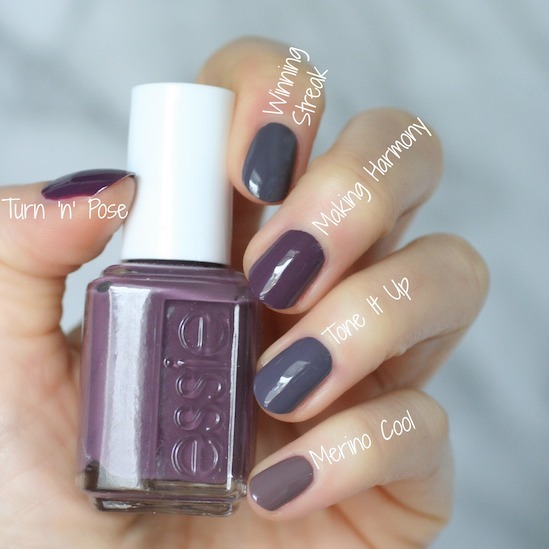 Another great collection and theme from Essie!! Essie shades tend to challenge my perceptions at first, but then they always grow on me and I end up buying a couple. 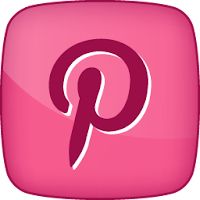 Will you be getting and reviewing the Seaglass Shimmer collection?? All Daisy Long has my name written all over it! Can't wait to get them. I bought 4 of the Seaglass Shimmers today!